Souvenirs are memories or mementos we take home from the places we visit. Most people like to commemorate the occasion with something representative of the location such as a photograph, post card or something else from the gift shop. 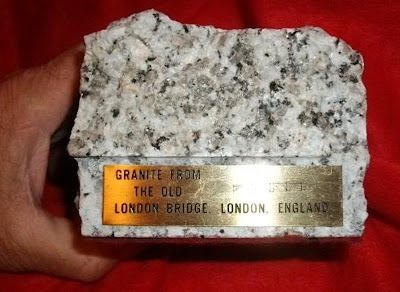 Other souvenir collectors like to have something from the actual location such as a stone from the London Bridge, a nail from Ford’s Theater, or wood from the White House. 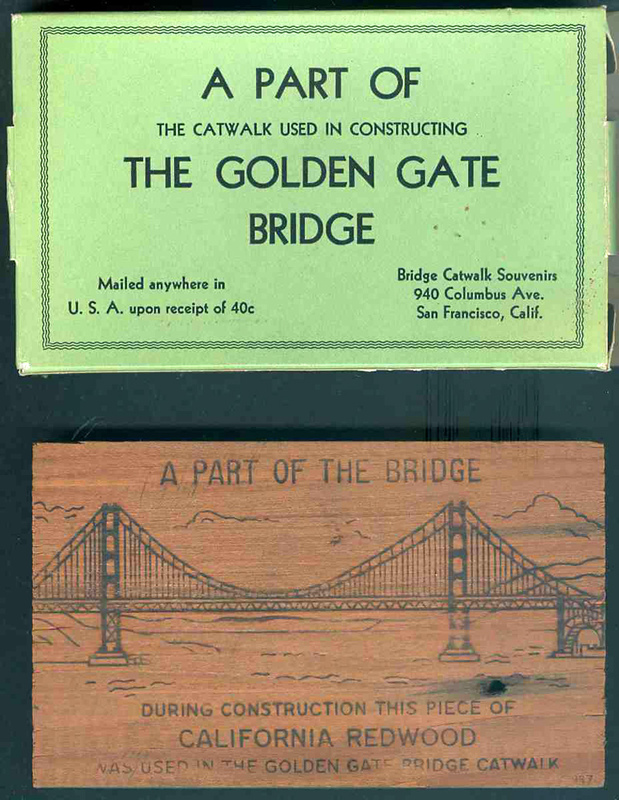 Now, I don’t recommend that anyone chip away at famous landmarks to bring pieces home, but I’ve seen a few items for sale on eBay, which seem to be official items sold as souvenirs and commemoratives. Set into a block of clear Lucite, a chunk of pink and black granite was part of Old London Bridge, which was re-erected at Lake Havasu City, Arizona, U.S. The paperweight dates from the late 60's, based on the wording, 'is to be re-erected.' 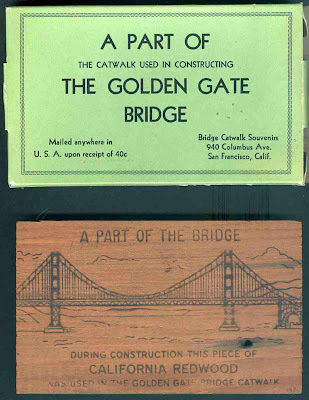 The bridge was re-dedicated in its new U.S. location in 1971. 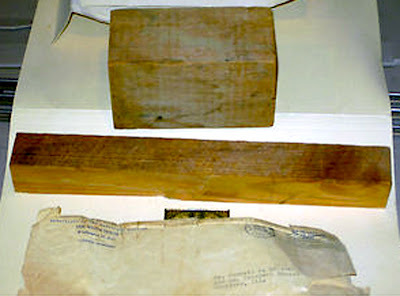 Roof wood and nail from Ford’s Theater, where President Abraham Lincoln was shot, in Washington, D.C. Mounted on a wooden plaque made from wood from the ceiling, it also has red velvet from a seat. 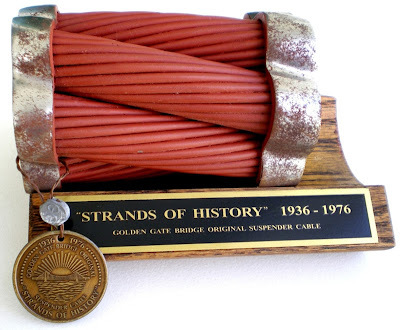 On the plaque is printed, “Handmade nail removed from original roof truss framing. Board removed from original roof. Velour covering removed from box and balcony rails.” The plaque measures 9 and a half by 8 at widest point. According to the auction listing, “There have only been nine of these made. 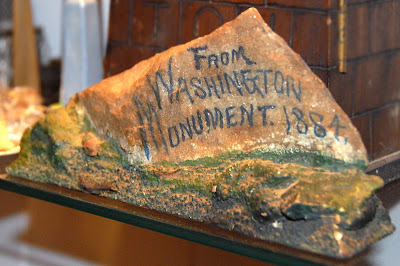 This item was presented to my brother-in -law who was a banker in D.C. and lent the money for the reconstruction. The restoration was performed by COE CONSTRUCTION, INC. under a contract of $1,928,000.00 with National Park Service of the Department of the Interior, between January 1965 and November 1967. A souvenir commemorative brick from the Waco Suspension Bridge that crosses the Brazos River in Texas. The bridge was built in 1869 by the John Roebling Company, the same firm that would later build the Brooklyn Bridge in New York. 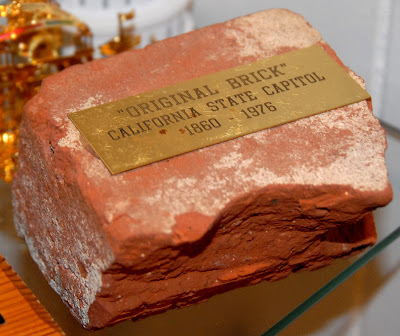 This souvenir brick was given to supporters of Waco's Model Cities Program in 1972. 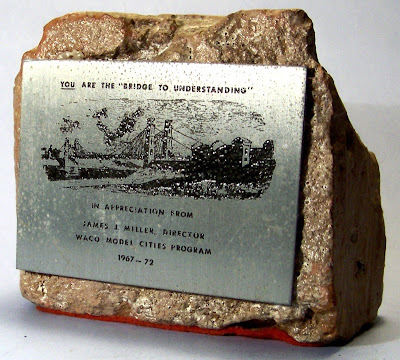 The front of the brick has a metal plaque with an etching of the Waco Suspension Bridge reading "You are the "Bridge to Understanding" - In Appreciation from - James J. Miller, Director - Waco Model Cities Program 1967-72". The underside of the brick is covered in red felt, and on the back is a typed card that describes how this brick was made in the same kiln as those made 100 years ago. 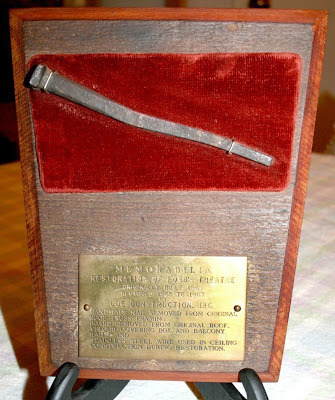 It is presented to "John Walker". 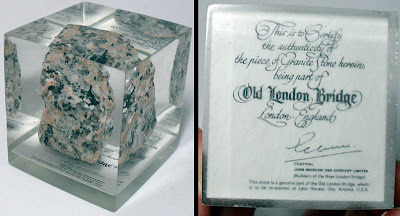 This souvenir brick paperweight measures 4" tall by 4.5" wide and 2.5" deep, and weighs 2.5 lbs. A limited number of “strands of steel cable” from the original suspender cable produced for the Golden Gate Bridge were kept and made into a souvenir authorized by the state of California. The imprint serial number is on the back of the medallion. A red brick from the California State Capital building with identification plaque. White House wooden material removed during renovations in 1950’s was auctioned on eBay in 2012. According to the seller, President Harry S.Truman had to remodel the White House, since it was falling apart. To help finance the renovation project, the government sold material from the original building. The two pieces of pine wood measure 2 1/2 x 2 1/2 x 5 3/4 and 1 1/4 x 1 1/4 x 10 7/8. Dave, When writing about architectural fragments, I'm a bit surprised no mention was made of the fragments in Chicago's Tribune Tower. There are 130+ fragments (from bldgs around the world) embedded in the outer walls around the base of the tower. Included are fragments of the Alamo, Angkor Wat, Notre Dame, Pyramids, Parthenon, Great Wall, Taj Mahal, etc. I've touched them, they are labeled, and make a very interesting tour around the planet. Biggest collection of fragments I've ever seen or heard of. Chris B.
Hi Chris, I was not aware of this. Thanks for bringing it to my attention. I will ad some info about this to the main post. Thanks!